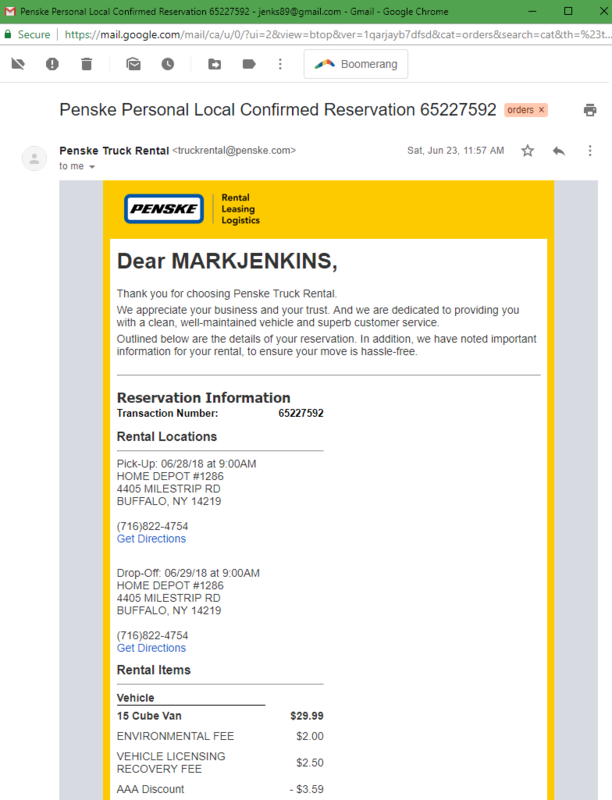 June 23rd: I scheduled to rent a Penske truck from you so that I could pick up all the cabinets on June 28th. 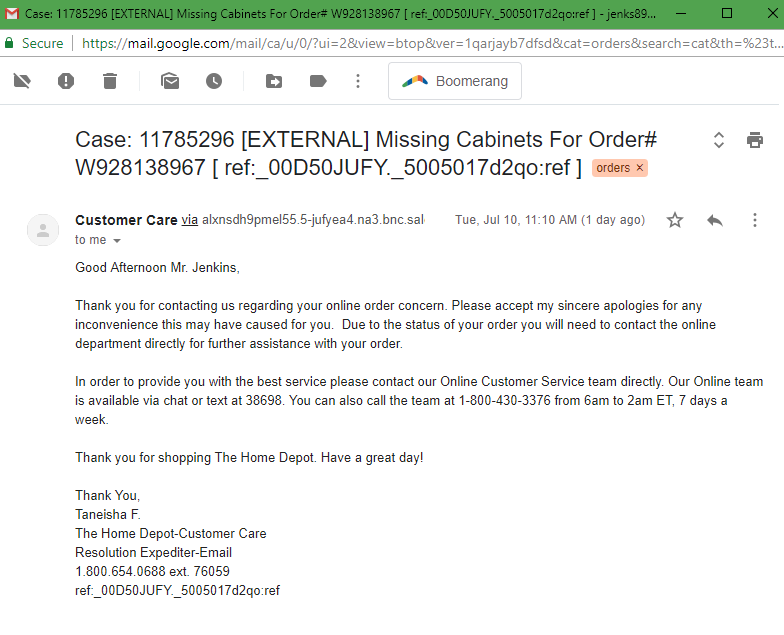 June 26th: I was told that the replacement cabinet arrived damaged at the store & yet another one was ordered. The due date for the 2nd replacement cabinet was by July 6th. June 28th: When I arrived at the Hamburg #1286 store to rent the truck & pick up the cabinets, I was told that the truck I was to get was not at the store because no one bothered to bring it over from another store. I rescheduled the rental and pickup for the next day. June 29th: The truck was there & I was told that my orders (this one, as well as Order #'s W928285386, W928769478, and W931015827) were all on 4 shrink wrapped pallets. Seeing as I was told I had to sign for the order before I saw it, I signed each with "SWP UTC" which means "Shrink Wrapped Pallets - Unable To Count". The order was brought out on pallets & we did break them down for loading into the rental truck. The piece count was correct. 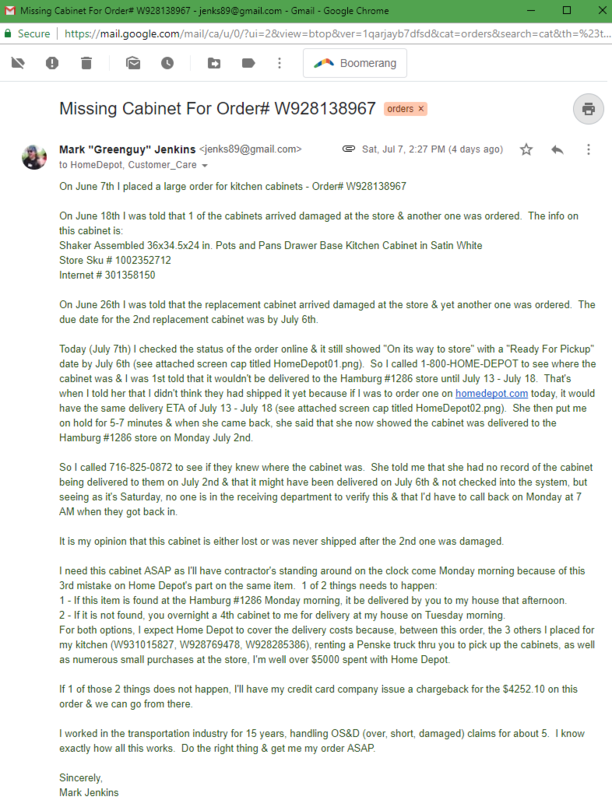 July 8th: I called 1-800-HOME-DEPOT again because, based on my years in the transportation industry, if the trucking company said the shipment was delivered on Monday July 2nd, this the cabinet was missing. They contacted the Hamburg #1286 store and told me that someone named Jeanie was going to go physically look in the receiving area for the cabinet & that she would call me. She never called. July 9th Part 2: I had scheduled my contractor to install the cabinets on July 9th as well. I informed him about the missing floor cabinet, so he started to work on installing the wall cabinets. That's when I found a new problem with this order: 1 of the other cabinets I ordered - Model # KWD2436-SSW - was missing from when I picked them up. Instead, I have 1 Model # KW2436-SW. The missing cabinet is the 1 diagonal/corner cabinet we have for the walls. That meant he would not be able to install any of the cabinets until the missing ones were here. July 9th Part 3: The contractor was also going to remove the existing window, widen the opening, and install a new window in the kitchen. The window I ordered from you (Order# W928285386) had a 1.5" crack/separation on the bottom corner and there was some kitchen caulk in the area that was broken. I doubt that the window maker uses kitchen caulk for any reason, so it is my opinion that you sold me a damaged window that another customer returned to you. 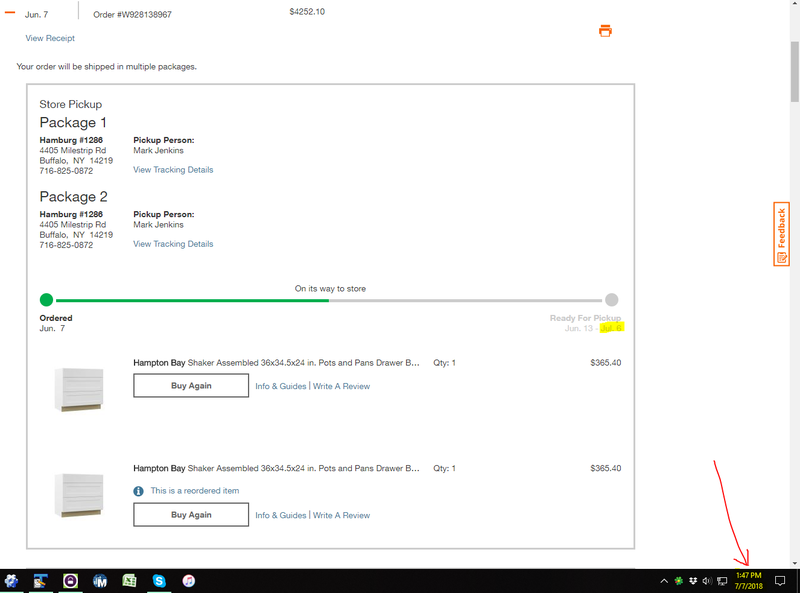 I looked to see if you or any other Home Depot stores had that size window in stock, but there are none in a 75 mile radius & if I ordered one, the soonest it would be here is in about 30 days. So now I have a 4'x3' hole in my kitchen wall. Needless to say, I had to pay the contractor & his crew for the day, as well as tell them that I had no work for them the next day because I knew neither of the missing cabinets were going to be here the next day. 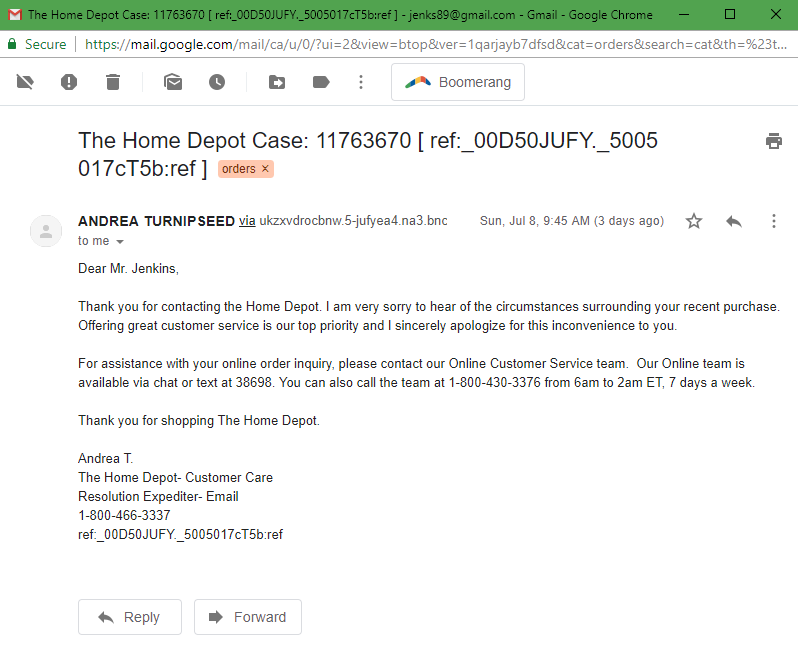 July 9th Part 4: I once again sent a long detailed email to HomeDepot@orders.homedepot.com & Customer_Care@homedepot.com and I made sure I started it out by stating: "I'm going to start by saying that I've already called 1-800-HOME-DEPOT 3 or 4 times, as well as spoken to the local Hamburg #1286 store at least 6 times in the past 3 days & I'm getting sick of explaining this mess to a new person each time, so I'd like for someone to read this over & call me..."
July 10th Part 2: I informed my contractor that the cabinets might be here Monday the 16th, Tuesday the 17th, Wednesday the 18th, or Thursday the 19th. So he's scrambling around to find work for this week & getting ready to possibly move the work he has scheduled for next week so that he can install my cabinets. He is not happy & I wouldn't blame him if he told me to find someone else. July 11th (Today): So not only do I have no kitchen, I have a hole in the wall where a window should be. I have to wait another 5-8 days for 2 of the cabinets that I ordered 35 days ago to come in. I have to arrange to pick up those 2 cabinets, as well as return the damaged window & the incorrect cabinet you sent me. I also have to pay the contractor & his crew to do nothing for at least 2 days, maybe more unless I somehow got lucky for the 1st time in this mess & he found other work. We just purchased this house & will be doing a lot of remodeling. 1st the kitchen, then the upstairs bath, then converting the downstairs bath from a half to a full, then our bedroom, plus we need a new fence. Between the online & instore purchases that were put on our Home Depot credit card (acct ending in 4351 & has my email attached to it) I'm at almost $7,000 spent at Home Depot since we moved in. 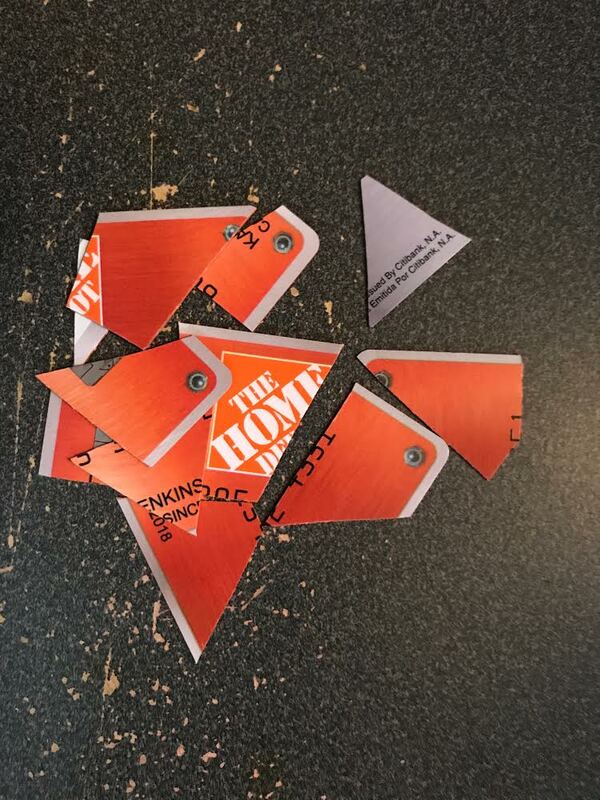 I was planning on using Home Depot for all these projects, so not only have you lost $10-15,000 in future business, you've basically given that money to Lowe's because I cut up our Home Depot credit card. I feel that I have given Home Depot every opportunity to make this right. 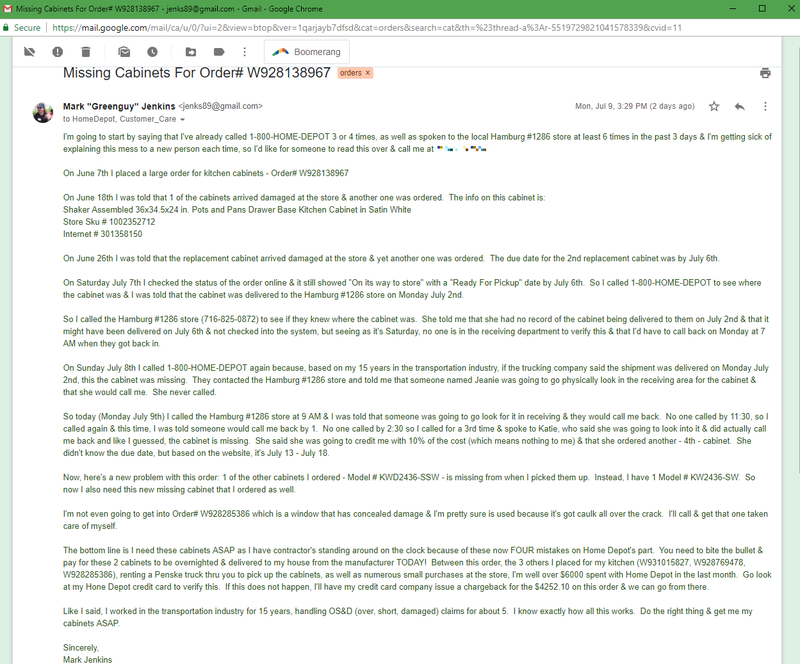 I am sending a copy of this letter & the attachments via US mail to every Home Depot address I can find, posting everything on my website at greenguy89.com/HomeDepot and I will be sharing it on every website & social media platform I can find. I am also extremely close to calling my credit card company an issuing a charge back for the full amount of $4252.10 for Order# W928138967 & we all know they will side with me, reverse the money & then we can all go from there. Hello greenguy89, and welcome to the Community! I'm sorry you are having a difficult time getting this matter resolved. 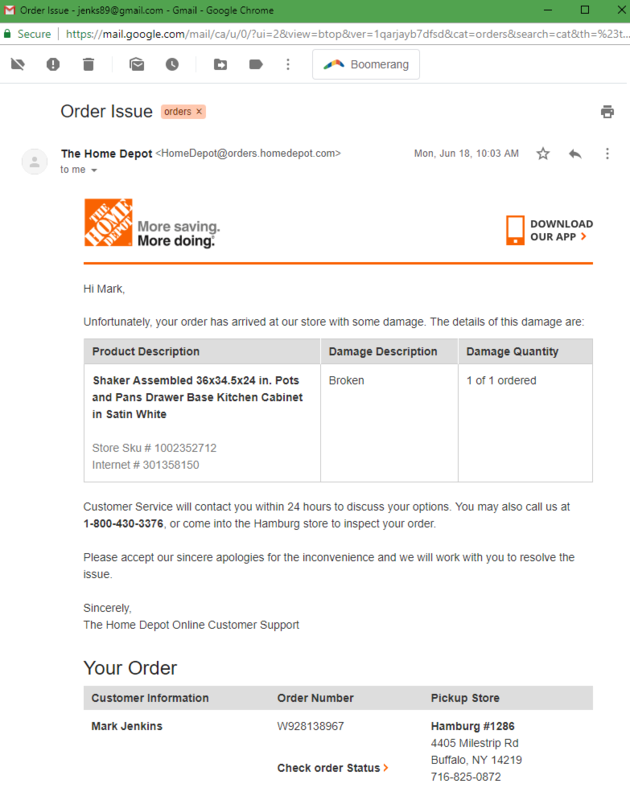 I have notified Home Depot Customer Care as well as the store manager at the Hamburg #1286 location. I don't work for Home Depot but I expect your experience won't be any different a Lowe's. Not that Lowe's is any worse (or better) than Home Depot but it's the nature of big box retail and the only people we have to blame is ourselves as consumers. We as consumers want low prices, the convenience of everything under one roof that's open from 6 a.m. to 10 p.m. and experts in every aisle that know everything. According to Home Depot's annual report about 8.6¢ out of every dollars falls through to the bottom line. 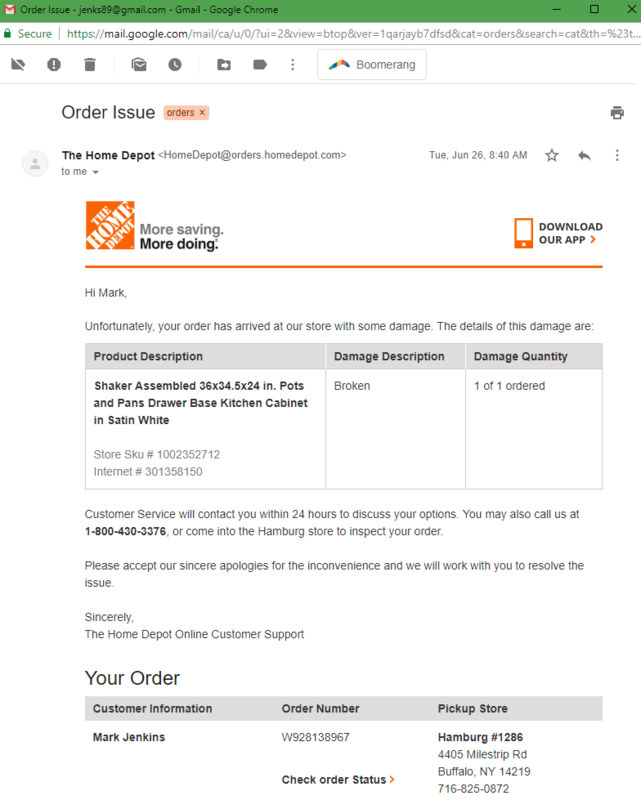 So your $4300 purchase netted Home Depot about $370 and the damaged cabinet about $35. Assuming you decide to shop at Lowe's and spend $15,000 there, Home Depot's loss is about $1,300 (or about 0.000015% of profits). You said you worked in the transportation industry so you probably have some idea of what it costs to have a cabinet or two put on a pallet and overnighted to your home. Does that make any fiscal sense from Home Depot's perspective? Big box is nothing but a race to the bottom.